Learn all you can about the type of bird you are getting. Equipped with knowledge and understanding, you will have a better idea of what to expect. You'll then be able to provide the pet bird care it needs and the result will be maximum enjoyment with. Which bird? 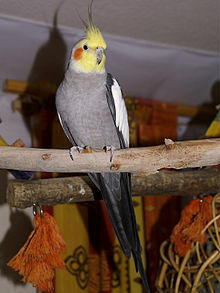 A canary, budgerigar or cockatiels make an excellent choice of pet for a family with very limited space or modest means. They are suitable for people living alone, especially flat dwellers. The care of these caged birds could hardly be more simple or undemanding, but the individuality they show depends on the degree of freedom they are allowed and on the stimulation provided by their surroundings and their companions. Health care routine: A yearly check up is recommended to check for general health problems, chlamydia and parasite infestations. Your bird should also be wormed every 3 - 6 months. Remember that birds often mask the signs of illness and may only show signs of been unwell when they are very sick. Housing: A well-designed and built aviary is the most satisfactory housing for birds, enabling them to live with freedom of movement and adequate opportunity for flight. Circumstances often dictate that birds are kept in cages, usually manufactured of metal with wire mesh screening. 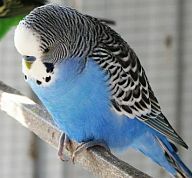 The minimum size of cage to house one bird will depend on the breed of bird. Queries regarding cage sizes should be referred to the RSPCA. The cage should be positioned in a well lit, sunny area where the birds will have frequent human contact, and in which it will be safe to be released for exercise if possible. A portable cage stand permits the birds to be repositioned for their comfort. Appropriate perches of varying size must be provided as well as well-secured food and water troughs. 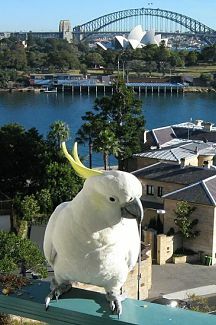 Perches are best made of natural wood of varying sizes eg branches from eucalypts . The food and water receptacles should not be positioned beneath bird perches and any accidental contamination of the food and water by bird droppings must be removed immediately. Feeding: The caged bird's basic diet should consist of the specially prepared seed mixtures. If your bird is on a seed diet it should have a variety of seeds and no more than 10-15 sunflower seeds per day. 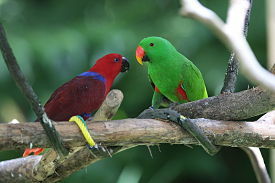 This diet should be supplemented with fruits and green foods such as broccoli, parsley and spinach.Grass should be provided daily for non-fruit eating parrots. Pasta, rice, toast, eggs, mashed potato, chicken bones and other meats can also be offered in small quantities. Cuttlefish bone should be available in every cage to provide many trace minerals required by birds. Do not give your bird chocolate, coffee or avocado as these are toxic to birds. Fresh water is essential to a bird’s life and must be replenished frequently in hot weather or if it becomes fouled.